Earlier this year, Prysm Inc., a collaboration solutions developer based in San Jose, Calif., commissioned Forrester Research to examine collaboration technology use in the enterprise. The study surveyed 1,000 professionals at organizations in the U.S. and U.K. working in companies with 1,000 employees or more. Two-hundred of those surveyed work in IT and facilities, and 800 are “information workers”—those who are actually supposed to be taking advantage of the benefits collaborations systems can offer during meetings. It’s no secret that IT’s relationship with its user base isn’t always smooth sailing, and the Prysm/Forrester study is another example of these two communities not seeing eye to eye. While 51 percent of IT/facilities workers believe their organizations provide sufficient collaboration tools, only 26 percent of employees say this is the case. Forty-nine percent of IT/facilities pros attest there is adequate space in their companies’ offices for effective collaboration, again, only 26 percent of employees agree. And then there is the issue of glitches: 45 percent of workers say that in technology-enabled meeting environments, it’s hard to engage all participants. 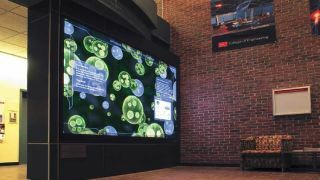 Mark Henkin, an expert in audio-visual systems for educational facilities at control and networking solutions manufacturer AMX by Harman in Richardson, Texas, noted that in providing environments that are conducive to collaboration, organizations need to think beyond the technology. He cites active learning classrooms as an example: commonly, schools will design their spaces to house a number of active learning pods made up of moveable tables. But tables are difficult to move around if they weren’t configured properly. “You think I’m joking when I say this, but I have been in spaces where they never move the tables because they didn’t put wheels on them,” he said. “That’s a basic thing.” He also adds that oftentimes those charged with space planning don’t consider what students bring into class. “They have coats, bags, books, and there is no storage under the chairs, no hooks on the walls.” Depending on the course—dentistry, for example—students may also be bringing tools and lab equipment. Solutions from Steelcase (steelcase.com) encourage collaboration by offering flexible, ergonomic seating & tech usage. Many organizations are mandating networked AV simply because it cuts down on the hassle associated with troubleshooting and fixing problems. “We’re seeing control systems as being increasingly more important for remote maintenance because you don’t necessarily need outsourced staff or even on-campus staff to be in that room to perform troubleshooting or service calls,” Gina Sansivero, director of business development for the education market at FSR Inc., a conferencing solutions manufacturer based in Woodland Park, N.J., told AV Technology last year. “That really helps when an instructor is having problems and they’re able to call the help desk and the help desk can access that room via the control system at that moment, rather than having to wait for somebody to take a little golf cart across the campus and run in and disrupt the class.” Further, remote monitoring capabilities enable IT teams to predict issues and make fixes before equipment actually fails. One of the main frustrations with networked AV is latency and dropped calls. Michael Johas Teener, senior technical director and plumbing architect at semiconductor manufacturer Broadcom, headquartered in Irvine, Calif., is one of the original founders of AVnu Alliance, which promotes the simplification of network synchronization through AVB and TSN through the issue of its own product certifications. “In a general IT-type network, there are inevitable delays in transmission and reception, and there are dropouts and changes in quality,” he said. “Using the technology we’ve developed gets around that so that we end up with deterministic delays and terministic quality assurances. And that moves a general IT network into something that’s a lot closer to the old-fashioned landline phone, where the quality is consistent and generally very good, and the delays are very low.” And, he noted, anytime you want people to interact effectively, paying attention to delays—or, more specifically, preventing them—is important. Carolyn Heinze is an AV Technology contributor.